Content. It’s a blessing and a curse. Content is at the core of marketing, and of so many other areas of business. From product to business intelligence to sales to customer care and support , HR, legal (this list goes on) businesses are tasked with curating, aggregating, creating, publishing and making sense of growing volumes of content. Yet the problems done end there. There’s a real trust in content, not to mention real context and personalization. From fake news to social media surfacing untrusted content, companies find themselves hiring armies of human content reviewers. There’s the problem of information saturation. Consumers and workers alike are overwhelmed with information volume, with notifications, and email. There’s a growing need to organize and synthesize content, particularly for information workers (financial services, corporate development, VC’s). Not only is content hard to track, but information velocity is steadily rising. Measurability is also more difficult; are you publishing in the right format, on the right device, around the appropriate topics? Creating and publishing more content obviously isn’t the solution at a time when engagement rates are at all time low. Is automation the solution to the content problem? 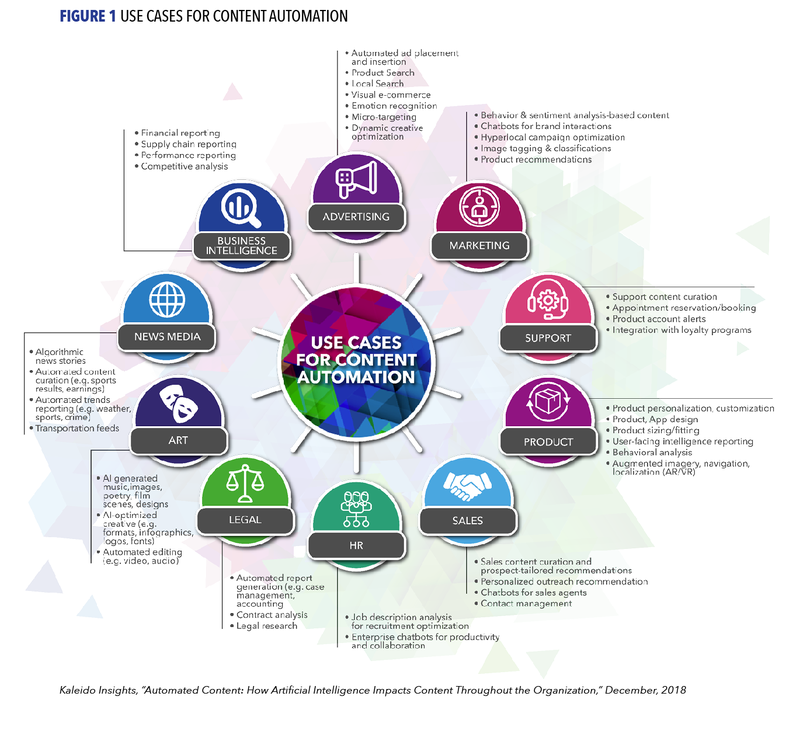 My Kaleido Insight partner Jessica Groopman and I have today published new research, Automated Content: How Artificial Intelligence Impacts Content Throughout the Organization. Together we spent over a year talking to senior marketing and business executives about how they use technologies – overwhelmingly AI - that automate content creation and publication, as well as content organization, analysis, and niches such as hyper personalization and localization. We very quickly learned that automated content is hardly limited to marketing and advertising. It has massive and very real implications for a variety of businesses and business verticals such as HR, legal, customer support and service, publishing and media industries, business intelligence, product and more. Scale: AP went from creating 300 quarterly earnings reports to over 4,000 articles using Wordsmith software to turn company data into full articles. Resource Allocation: Those AP writers who were formerly churning out template earnings reports can now dedicate their efforts to much more interesting and challenging work that requires more human skills, e.g. investigative reporting. Production Automation: Wibbitz is a tool that can take the video production process down from c. 4 hours (using traditional video editing software) to a 10 second to 5 minute turnaround, generating a short video to accompany a blog post or article. The writer need only input text into the platform. Customer Support: Not everyone thinks of chat bots as a form of automated content, but they are. They can handle routine customer inquiries and even pass cases back and forth to human agents when the need arises. The result is lower costs to the organization, alleviating tedium for human agents, and happier, swifter outcomes for customers. The case examples go one and one. AI can sort and organize content, recognizing images and pictures and linking concepts, greatly increasing the efficacy of tools like a digital asset management system (DAM). Attorneys can find case law, legal precedents and even use AI to help craft contracts and arguments in court. Marketers are using AI to hyper-personalize content and offers. AI can analyze huge amounts of data, creating reports, recognizing trends and finding opportunities for business intelligence. The first ingredient is data Automation won’t be cost or time efficient if there isn’t enough data to power the narrative. Even if a company is digitally focused, data is often dispersed or it isn’t organized in a way that is ready to be used by automated content system. Unstructured data still problematic The data that goes into a system determines what comes out. It must be correctly formatted for this purpose. The approach must be multi-disciplined Automated content requires a variety of viewpoints to make sure content is on brand, aligned with communications strategy, is accurate, and flows from available data and systems. Transparency and data permission are imperative Organizations that use information customers and prospects don't know they have can creep people out, or even violate laws. Human supervision is required Algorithms still aren’t too great when it comes to nuance, satire and humor. Opinion pieces are better left to humans, as is fact checking and general creativity. Integrity, authenticity, and brand voice are just a few aspects that require human supervision. Content automation won’t be set-it-and-forget-it for a long, long time – if ever. Algorithms aren’t neutral because they are created by humans. Algorithms are created predominantly by white males who live in Silicon Valley. The work they create is subject to their own perspectives, biases and limitations. So the ways in which data are interpreted and delivered can be colored by these outlooks, irrelevant at best, or offensive at worst. The above is just the tip of the iceberg. Please download our research for the full story (it was written 100% by humans, guaranteed). We’d welcome your thoughts and reactions to our research! This post originally published on the Kaledio Insights blog.